Asphalt 8:Airborne game for Android, iPad and iPhone, which will feature all new maps from the Nevada desert to the city streets of London, plus a bonus revamped Monaco track for Asphalt 7 fans. 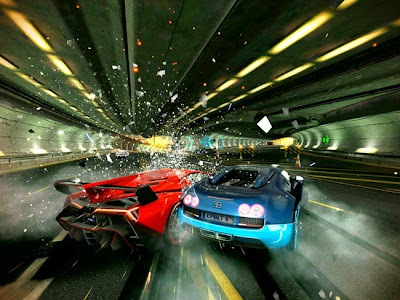 It is the eighth game in the Asphalt series, the best arcade racing game. The new game available for download from the Google Play Store and iTunes App Store, priced at $0.99 (USD). Perform dynamic, high-speed aerial stunts in an intense driving experience powered by a brand-new physics engine! Asphalt 8 will feature both synchronous and asynchronous multiplayer so you can challenge your friends around the clock! Asphalt 7 fans will be happy to note that Takedown mode is returning and have added two new MP modes in Asphalt 8: Gate Drift & Infected. In Gate Drift you're challenged to "drift" through multiple gates. The more you get through, the more points you get. While, Infected is more of a big game of tag. One player starts as "infected" and must hit another car to pass the infection along and regain their health. If they don't pass the infection to someone within 20 seconds they're eliminated.